In the South, for some, football is the next thing to a religion. Most Southerners have a team they pull for all season long, we stick with them through the good and the bad; through and through we are die hard fans. At the end of August when the air gets crisp and the leaves start to fall that’s the signal football season has officially arrived. It’s time for the tailgate, the game, and the post celebration; all leading up to the bowl games, and hoping your team has a good enough season to make it to one. I have to give a special nod to the team I pull for all season long before I touch on the Bama v. ND game. Congratulations Vandy for having such an amazing season and your first 9 win season since 1915! Great win in your bowl as well! I have to admit I was torn on which team to cheer for Monday night, but in the end I made the wise decision to pull for Alabama. 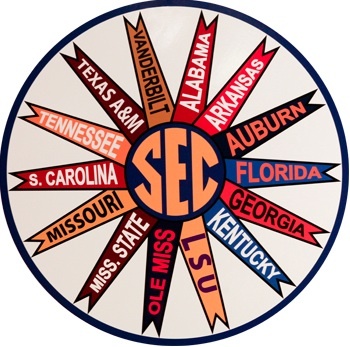 They fought the good fight and earned the SEC its eighth BCS Championship and a total of 6 SEC bowl wins for the season! 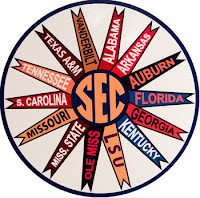 And Congratulations to all the other SEC teams who made it to a bowl game this season! The most important thing to remember about dressing for an SEC game is that the color of your clothes state who you will be cheering for. The SEC Women wear sundresses, sunglasses, boots or sandals in warm weather. When the weather gets cooler it is acceptable for the SEC Women to wear jeans and a sweater. When the weather gets cool it is acceptable for the SEC Man to break out the jeans, cords, sweater, or a school sweatshirt. what about gameday polo's for men?! I need to do a post about polo's for men, I need to be better about do post for men's ware. How I am planning on doing a post on bow ties later today since it is national bow tie day!